Hi everyone! 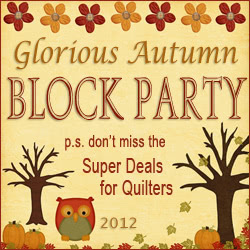 Welcome to Block 5 of our Glorious Autumn Block Party. Today we have Patricia Lines as our featured designer and Contemporary Cloth has a fantastic 35% Super Deal too. 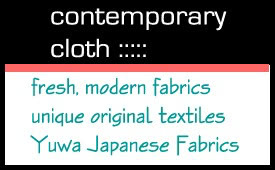 Super Deal from Contemporary Cloth Inc.
Hello! Contemporary Cloth is your online place for fresh, modern, + unique fabrics for your sewing adventures, quilting and other creative pursuits. We carry a variety of fabrics and specialty notions for quilting, home décor, crafts, mixed media arts and more. What is different about us? We focus on bold, modern prints, Yuwa Japanese Fabrics, organic fabrics and textiles created by fiber artists. See our fabric wall hangings and stencils + tjaps/wooden stamps from India for surface design. We plan to offer more original screen printed fabrics soon. Click here, to see them all! What is new at CC? The amazing Melissa Dunworth’s BitterSweetBundles, which are a unique selection of fat quarters. They are bundles “outside-the-box” and will make your quilts zing with personality! In addition, we have a new selection of Pre-cuts and Solids. See all of our New Arrivals and our Clearance Category of 50% off Alexander Henry, 30’s reproduction prints, black + white designs, etc. Our “color + pattern” blog posts suggest ideas and inspiration for design. We intend to start a “color + pattern” group on Facebook and hope that you will join us, so stay tuned! 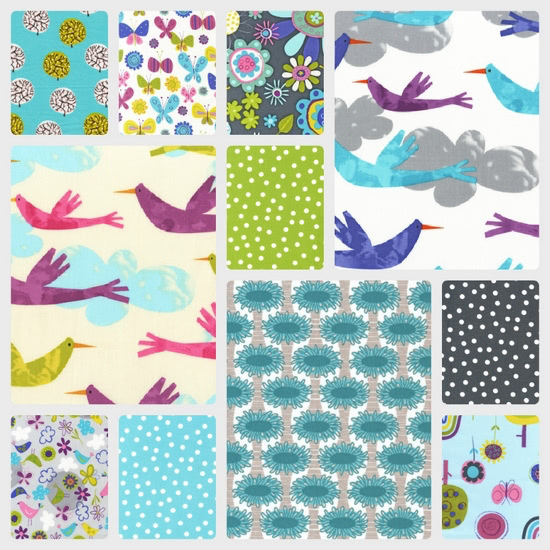 35% off Fly Away + Remix by Kaufman Fabrics and selected Cloud 9 Organic Fabrics. Your discount will appear when you check out. No coupon code required, just visit the check out page to see your updated cart. Deal expires September 20, 2012. Here is a sample of the 35% off fabrics. I grew up sleeping under quilts so they have always been a part of my life. 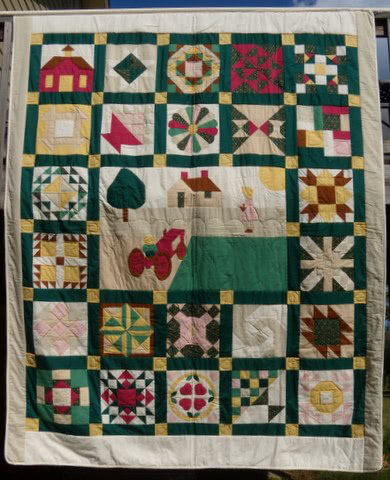 When I was expecting my first child in 1975 I “made” my first quilt by putting packaged binding on a pre-quilted panel. The next year I made a “whole cloth” baby quilt by machine stitching on the lines of a cute baby print for my sister’s baby shower. I made several of those for babies in the next few years. I took my first quilting class in 1979, it was a hand piecing and hand applique class. I made two throw pillow shams. I did not get to pick the colors since a kit was provided with the class. They are quite faded and worn now so I no longer use them on pillow forms but I haven’t been able to throw them out. The “by hand” didn’t stick well, I can do it and it even looks good but I prefer to sew by machine. When I was pregnant with my third child I made two machine appliqued wall quilts for the nursery. I watched many quilting shows over the next few years, thank you Georgia Bonesteel and Eleanor Burns, bought a few books and magazines and learned as much as I could about quilting. Eventually I got up the nerve to make a bed size quilt for my parents’ 50th wedding anniversary in 1984. Well, I designed that full sized quilt for my parents’ anniversary. It is a sampler quilt and I spent months looking through every quilt block pattern book I could get my hands on, which in the early 80s there were not that many. I chose blocks that had names that related to some aspect of my parents’ lives and made a pictorial center panel. Finding fabrics for it was also difficult and I had to use a good many poly/cotton blends in it to get the colors I needed. I persevered and used Georgia Bonesteel’s Lap Quilting method of construction (now known as Quilt as You Go). I did study Art in high school and college so I guess being creative is just part of who I am. If I decide to make something I can usually figure out a way to get it done. I did hand applique and machine piecing on the blocks. Each block was layered and hand quilted then they were joined by machine and the back edges hand stitched down. It is the only bed size quilt I have ever hand quilted. When I opened my quilt shop in 1996 I soon learned that Block of the Month programs were becoming popular. I did purchase several to use but moved to designing my own within a few years. It was a blast to see quilters coming in each month bringing blocks that I had written the instructions for. Electric Quilt and Block Base became my biggest helpers and I still use them. I also designed kit patterns featuring specific fabrics. Since I retired from retail ten years ago I have continued to design quilts for myself and others. I plan to start selling some of my designs soon. My favorite quilt is a wall quilt that I designed and made for a guild challenge. I was in charge of the challenge that year and each participant drew a bag with two crayons in it. They were to make a quilt using those colors in any value range. My crayons were a bright golden yellow and a deep rich brown. 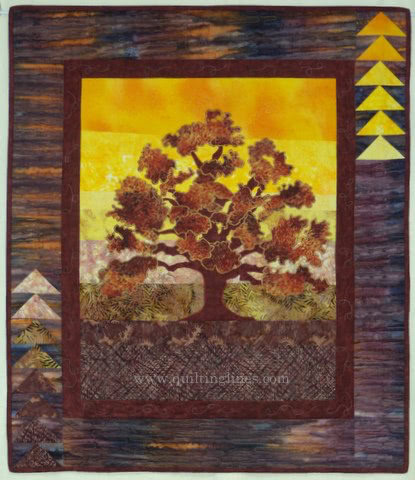 I love trees and even though I don’t usually do much applique, this tree seemed to flow from me. It is fused and machine appliqued. I quilted it on my longarm and backed it with a vintage fabric. I didn’t win the challenge but I love the quilt! How many UFOs do you currently have? Way more than you would believe or I will admit to. I actually have them listed on a spreadsheet and they are all very well organized with the fabrics, parts and patterns in boxes or trays. A picture of some of them may be seen in this post about My Studio. (Except for the 20 or so I’ve been working on recently that may be lying around in the studio waiting for more attention.) Tops, many with their backing fabric, are on hangers waiting to be quilted like the one shown here. What size of quilt do you prefer to make/design? I usually make lap or bed size quilts. What colour do you use most often in your quilts? I love them all and tend to design based on value not color. Without contrast the line of a design is lost. 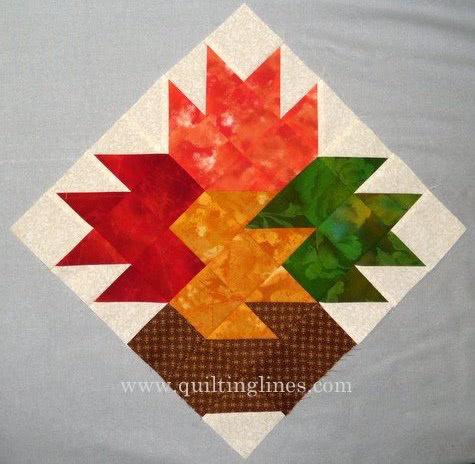 I’ve made quilts with many color schemes and helped students and customers plan even more. I do like to use yellow as an accent color. An accurate ¼” foot and seam, a decent machine with the needle-down function and good tension make a quilter’s life much, much easier. I have collected quotes for years and have many I love. I start my blog posts with a quote that I think fits the topic. I have a bit of fun looking for them. You can see them there. I only rip out a badly aligned intersection 3 times. If it doesn’t match after that I live with it or toss it. Quilting is hobby, albeit an expensive one, if you’re not having fun, why are you doing it? Here’s Patricia’s block, Leaf Vase. Isn’t it gorgeous. Patricia has included a downloadable file and a photo tutorial with great tips on putting together this block. Head over to Patricia’s blog to download the tutorial. 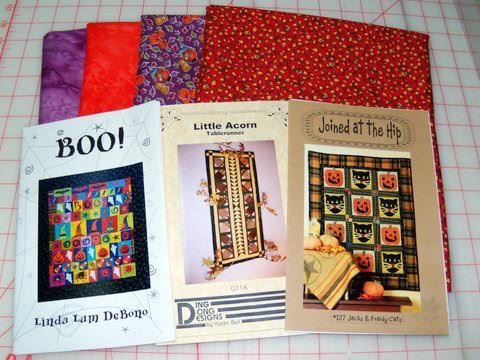 Patricia wrote: I will be giving away 2 batik fat quarters, 2 – 1 yard cuts of fall prints and 3 fall patterns. There will be 3 winners and the drawing will be held at the end of September. 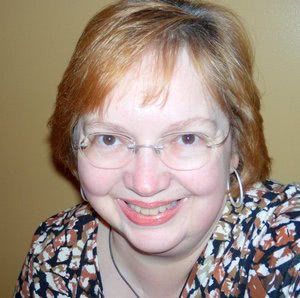 Visit Patricia’s blog to enter the give-away. Your Guild Challenge quilt is just gorgeous! I too love your guild challenge. Your guild challenge quilt is beautiful. I love your leaf vase block. It’s so different. Your challenge quilt is wonderful, Patricia; I love it! Thank you for a lovely block design and sharing your talent with us. Your challenge quilt is really beautiful! It was fun to read all about you too! WOW, your challenge quilt is gorgeous! Your block is great too, thanks for sharing. Dogwood trees are my favorite any time of the year. Right now in IL, the dogwood leaves are beginning to turn red.